King Bolete (Boletus edulis) Boletus variipes and other. I am David Spahr. I live in the town of Washington, Maine located in Knox County, midway between central and mid-coast Maine. I am known by some as the "Mushroom Maineiac" The species on this site are nearly all gathered and photographed within 35 miles of my residence. I created, photographed, designed, and built all content unless otherwise noted. Almost all mushrooms pictured I personally ingested. There is risk in consuming wild mushrooms! Use of the mushroom-collecting.com website will constitute your acceptance of the disclaimer. This is a learning process that can take a lifetime. Do not go right out picking! Get good books. Find an experienced teacher or a club. Learn the rules for collecting. Be very careful. Mushrooms listed as edible in some field guides may not be edible in your area. The lilac brown bolete (Tylopilus eximius or Sutorius eximius) is usually listed as edible. In Maine, there have been many poisonings from this one. Do not eat it. Angel wings (Pleurocybella porrigens) are a thin and white oyster-like mushroom found growing on conifers. There have been some reports of poisoning recently although most field guides list them as edible. Angel wings should be avoided. Mushroom-collecting.com is about giving you inside information on finding mushrooms. During the past decade, when I wanted to be able to locate new species I would often ask other mushroom hunters, brokers and others how I would find mushrooms like matsutake or black trumpets. I most often received general or somewhat sketchy descriptions of how to do that. Many are protective of their knowledge and "their" mushrooms. Field guides give a "mycological" general description of the ecology such as: "several to gregarious under hardwoods and sometimes conifers in the eastern United States from July to September". I don't find a description like this particularly helpful. I will try to avoid such dry, general descriptions. There are some species that will get more detailed descriptions because I find them more often and know more about them. This site will evolve as I continue to learn and photograph and cook. Mushroom-collecting.com provides useful ideas for cooking mushrooms. I love to cook. My mother started teaching me about 1957. I research and experiment with mushrooms and other foraged food in my kitchen almost daily. Many people look at the different types of mushrooms and are not sure how to prepare them. Mushrooms are like vegetables. They have different flavors and have widely varying textures and colors. Water absorption varies widely among the different species. Most mushrooms only respond well to certain cooking techniques. I have seen well known television chefs do absolutely dreadful things with wild mushrooms. I have heard them say things that showed they were not well versed in the mushrooms they were using. Generally, it is not wise to mix wild mushrooms with white button, cremini, or portobello mushrooms (all Agaricus bisporus) from your supermarket unless you want your wild mushrooms to taste like the strong flavored agaricus. Porcini and maitake may maintain their character but chanterelles are easily lost. Many wild mushrooms are just too rare, subtle or distinctive in flavor to be mixed or combined in certain ways. It makes as much sense as using Château Lafite-Rothschild to make holiday punch! See the Evaluating flavor using basic processes page for ideas about best usage. Mushroom-collecting.com is about increasing awareness of medicinal species. Many mushrooms contain unique medicinal components. Rather than making unfounded claims, links go to studies from respected resources such as PubMed from the NIH Library, the American Cancer Society, Sloan-Kettering Cancer Center and other scientific sources. Presently, there are some overly ambitious assertions about mushrooms being generated by some who are selling mushroom products. Very few human studies have been done. I'm trying to keep it real here so if you think I have crossed the line, feel free to let me know. Mushroom-collecting.com has information about dyeing fabrics and paper. Anne Williams of Stonington Maine, generously shares the discoveries of her many years of research in dyeing wool with mushrooms. She does have unique mushroom yarn you can buy. Mushroom-collecting.com is not about identifying every mushroom found in Maine. That is too much ground to cover and there are other sites that do that exceptionally well. It is not about hallucinogenic mushrooms. Do not try to pick hallucinogenic mushrooms! Little brown mushrooms can be very difficult for even mycologists to identify. Eating a Galerina by mistake could result in death! This site is about the easy to find, relatively safe, edible and medicinal mushrooms found in Maine, New England and Eastern Canada. Most of the species covered are found in many parts of the world. Edible mushrooms with questionable relatives may be omitted. Some edible species are excluded if they are hard to find, flavorless, or of questionable edibility where a few people experience gastric upset. Leccinum species (scaber stalks) and slippery jack (Suillus luteus) will not be covered although listed as edible in most books. These two examples fail on two counts since they don't agree with some people and have marginal culinary value. I have collected and consumed wild mushrooms since 1972. Good information about edible mushrooms was hard to find in the 1970s so it was fortunate I did not poison myself considering the less than excellent books I was using. That said, I was actually quite careful only eating large puffballs and fairy ring mushrooms at first. I endeavored to add one or two species a year to the mushrooms I was eating. It was not until 1981 when the National Audubon Society Field Guide to North American Mushrooms by Gary H. Lincoff was published that I started getting more serious about collecting. I like his use of common names and try to learn the accompanying Latin names of the mushrooms I care about. The photographs are mostly excellent. I have referred to that book countless times studying it from cover to cover. I still don't know them all. When I started there was no internet and no mushroom groups. At first, I didn't know anyone else who did this and was not aware of any clubs. The learning process was slower. It was a hobby that kept gaining momentum. I am a member of the Maine Mycological Association and often attend their organized group forays. It has been an honor to learn from Dr. Sam Ristich, the founder of MMA and one of the original mushroom gurus and the many other knowledgeable mushroom experts and fanciers. I have the heart of a hunter, farmer, and cook more than the heart of a scientist. I have a foragers mentality. I loved everything outdoors since I was old enough to go outside. We had farm property and lived right next to a lot of woods so I spent a lot of time there. Close encounters with wild and domestic animals, plants, and trees were daily occurrences. For me, everything in the natural world is awesome. I certainly do respect peer reviewed scientific methods of inquiry and understand how that differs from anecdotal evidence. I do use a microscope occasionally for learning and identification. I culture spores and grow spawn but mostly for the purpose of growing mushrooms around my house and woodlot. Rather than having a lot of logs or a growing room I am attempting to induce growth of local wild (and other) species around my property using slurries, transplantation, plug spawn and other strategies. I envision my woodlot and surrounding property as a mushroom and wild plant wonderland in a few years. Some strategies are my own ideas and as yet of unproven worth. Since I have a lot of ideas, I am seeing which will "stick to the wall". (Stump culture did not stick) This has been going on since the early 1990s. This site will be eventually linked to future sites related to "forest farming" and foraging that will eventually have different working titles. I am available for private and semi private mushroom/foraging walks and mushroom talks with a PowerPoint show. I know quite a bit about plant and other foraging as well that will be shared on mushroom walks. I also do mushroom cooking demos and point and shoot mushroom/nature photography instruction. Email or call me for more information. I do two day mushroom walks in conjunction with Le Vatout Bed and Breakfast in Waldoboro Maine where I also cook the dinner on the first night. Call LeVatout for arrangements. I also do one day walks at Squire Tarbox Inn at Westport Island Maine, and Hartstone Inn in Camden Maine. 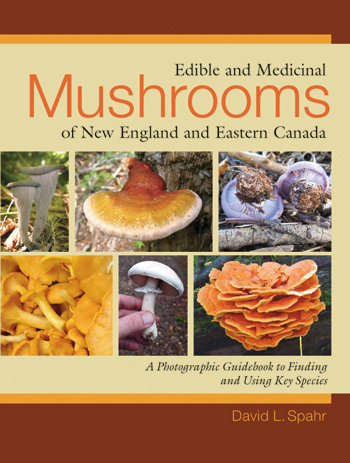 My mushroom book Edible and Medicinal Mushrooms of New England and Eastern Canada has been released as of 7-21-09. You can email me for author signed copies or pay $20 + $3 (shipping) USD by PayPal using this email address. I also accept checks. Maine residents need to add $1 more for sales tax. Canadian pricing is $20 + $7. It will also be available in book stores and online. That supports the author less well. You can read Amazon customer reviews here. I have appeared on the "207" a Maine TV news magazine cooking wild mushroom twice baked potatoes. See it here: 207. I have also appeared on DeliciousTV episode 406 on PBS. In 2011 I appeared on "Gourmet on the Go" on Canadian television produced by Trinome. See a clip HERE. I was a member of the Maine Mushroom Task Force working to develop certification rules for commercial mushroom foraging. I moderate the Northeast Mushrooms Yahoo group. I can also be found on Facebook where I upload information and pictures daily. If you like my photography, I have products like tee shirts, aprons, coffee cups, and other items available here. Copyright 2014-2015 Mushroom-Collecting.com. All rights reserved. Use of this site will constitute your acceptance of the no warranties disclaimer. Email policy: I offer to accept unsolicited commercial e-mail advertisements from you in return for your promise to pay Mushroom-Collecting.com $1,000 each time you send email advertisements to any addresses at Mushroom-Collecting.com. Use of the Mushroom-Collecting.com address to send unsolicited commercial e-mail advertising will constitute your acceptance of this offer.